Becoming one of the Ultimate Warriorz isn’t going to be easy, but it will be a lot of fun. You will need to be clever, make the dice behave, and beat up your friends to become the last one standing. 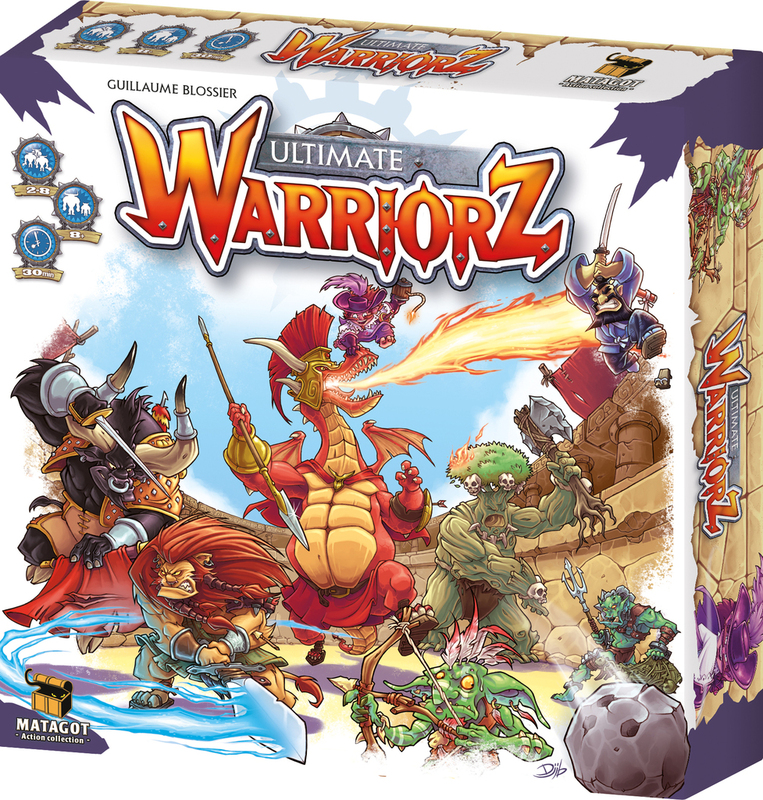 What is Ultimate Warriorz like? At it’s heart this is a very simple and straight forward player elimination game dictated by dice rolling. This might scare some people away, and normally I would be one of them, but not in this case. Each player will play one of the 8 completely different “characters”. You can play a giant towering dragon that has is hard to kill (but easy to hit), or a quick agile ninja that can really deal out so damage while being hard to hit (but can’t take that many hits before dying). Each character comes with its own deck of card and all cards are unique to that character. Winning the game can be done in two ways: Be the last character standing, or be the character with the most points after 7 rounds. To start the game of each player places his character on of the 7 different combat zones and then the first round start. All players secretly choose one of their 8 cards to play. The card will both dictate if you have to move and what type of attack you can make (melee or ranges) and it will also include a defensive value. You try to damage enemy characters by rolling dice (equal to the value on the card you played). For each die that’s equals or higher the defensive score on the enemy card you are trying to hit, you score a point (or 3 if it is the first time he/she/it takes damage). This might sound very simple, and truth be told it is, but not in a bad or boring way. Picking the right card at the right time can actually be quite a challenge and something you have to think about. Since it not only determines who you can potentially attack, but also the power of the attack and your defensive value until your next turn. Will you make a powerful attack to get more points leaving you open to counterattacks? Or will you play more defensively? This and the fact that each character has its own unique deck of cards, and unique number of hit points is what makes this game an interesting one. This is a game that some people will love and some people will hate. If you like fun confrontational games you will most likely love this. If you only like serious deep strategical games, then you will hate this. For me it was a very enjoyable game, one that I’ll gladly play again and again. It’s not for everyone one, and is better in some situations than others. With a beer in your hand or as a fun family game, I think it really shines. It’s definitely a game that’s a blast to play. But only if you know what you are getting into. But with the right people I guarantee a lot of laughs and a great time. Though player elimination can kill the fun the game is so short it doesn’t matter. This game has a very strong theme for sure, everything revolves are fighting and the dice work well as a randomizer. The stunning cartoon-like art on the cards and the creatures themselves makes the silly fighting theme stand out even more. Without it would be a dull game indeed. The overall quality of the components are great. Nice big cards, thick cardboard for the warriors and a very nice rulebook. But what really makes this shine is the arena you build using the box and the extra sides you insert. This is a great use of the box, one I would love to see used more in the future. The rules are short and easy to understand and it’s an easy game to explain to new players (even players that don’t have too much experience with board games). Thanks for your input, it’s always nice to hear other peoples thoughts on the games I review. It is not a game for everyone for sure. And not a game that will work in every situation. But for the type of game it is (a fun, fast, random, kill your friends type of game), I think it’s a very good one. That’s why it ended up with the high ratings it did.